Garmin’s Approach X40 combines a sleek and stylish slim wrist band with detailed golf data including distance to greens and hazards on more than 40,000 preloaded worldwide courses. Autoshot round analyzer, Elevate Wrist Heart Rate, Activity Tracking all on a High Resolution, 1” Sunlight Viewable display. Available in 3 Colors. 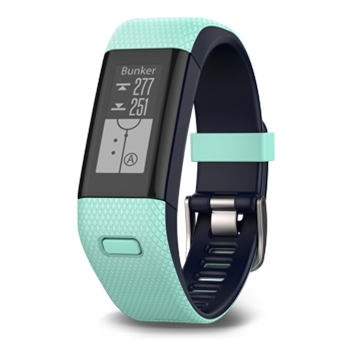 Garmin's Approach X40 is a slim, lightweight GPS Golf band that also offers fitness tracking and is available in 3 Colors. Choose from a Black/Gray Band, a White/Black band or a Frost Blue/Midnight Blue Band. With detailed information including precise distances to greens and hazards, the X40 comes preloaded with over 40,000 updatable courses. AutoShot Round Ananlyzer automatically tracks shots along the fairway, measures distances and provides post-round analysis via GarminConnect. View Precise Yardage to the Front, Back and Middle of Green. Layup and Dogleg Distances, Shot Distances, Stat Tracking keeps track of fairways hit, greens in regulation evens putts per round while The Digital Scorecard tracks your score throughtout your round. Compatible with Garmin's TruSwing the Approach X 40 provides metrics to inprove swing consistency making your golf game better. When paiored with a compatible Smartphone or Tablet the X40 with Optional TruSwing shows real-time, 3D ANimations showing how your mechanics affect ball flight and shot results. For the fitness conscious, the X40 includes Elevate's Wrist Heart Rate Technology which measures your heart rate on your wrist 24/7 and can provide accurate information such as Calories burned. 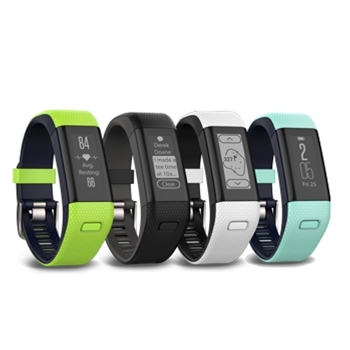 The X40 also includes activity tracking and reminds you to stay active whether on the course or off. A Move Bar Alerts you when you've been inactive too long. View Steps, Calories Burned, Distance and Time right on your wrist! Plus, the X40 syncs with a compatible Smartphone for Smart Notifications alerting you to calls, texts and emails right on your wrist. 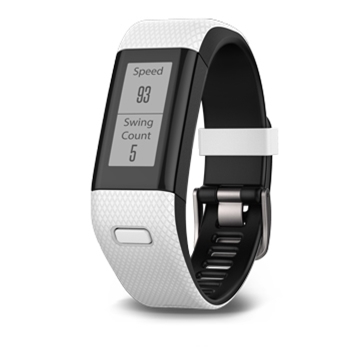 Whether your Goal is a better golf game or day to day fitness info, the X40 does it all. Each Garmin Approach X40 GPS Golf Band comes with: Garmin Approach X40 GPS Golf Band in your Color Choice, Charging/Data Clip, Manual and a One-Year Warranty. Garmin’s TruSwing is a great addition to your golf game! Measuring the mechanics of your swing and analyzing it providing detailed information to your compatible Approach Device, Smartphone or Tablet with GarminConnect! Provides information on Swing Tempo, Swing Speed, Club Path, Shaft Angle and More – Important information since all that data will affect the ball flight and your end shot results!